Andrew Byrnes ’05 (far left) and his teammates on the Canadian men’s eight show off their gold medals at the 2008 Summer Olympics. Photograph by Adrian Wyld/Canadian Press. Dinos Lefkaritis '19, Cypriot downhill skier, Winter Olympics, Pyeongchang, 2018. 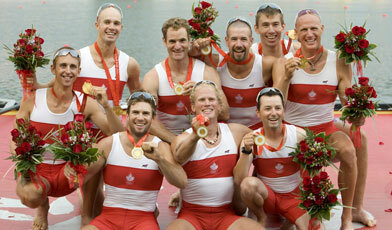 Andrew Byrnes ’05, Canadian rower (men’s eights, gold medal), Summer Olympics, Beijing, 2008. Silver medal, men’s eights, Summer Olympics, London, 2012. Justin Freeman ’98, U.S. Nordic skier, Winter Olympics, Turin, 2006. Mike Ferry ’97, U.S. rower (advanced to semis of double sculls), Summer Olympics, Sydney, 2000. Nancy Ingersoll Fiddler ’78, U.S. Nordic skier, Winter Olympics, Calgary, 1988; Albertville, 1992. Arnold Adams ’33, U.S. track and field runner, Summer Olympics, Los Angeles, 1932 (did not compete due to a foot injury). Art Sager ’26, U.S. track and field (10th in javelin), Summer Olympics, Amsterdam, 1928. Vaughn Blanchard 1912, U.S. track and field (advanced to semis of 110-meter hurdles), Summer Olympics, Stockholm, 1912. Blanchard also competed in the exhibition baseball tournament at the 1912 Olympics.